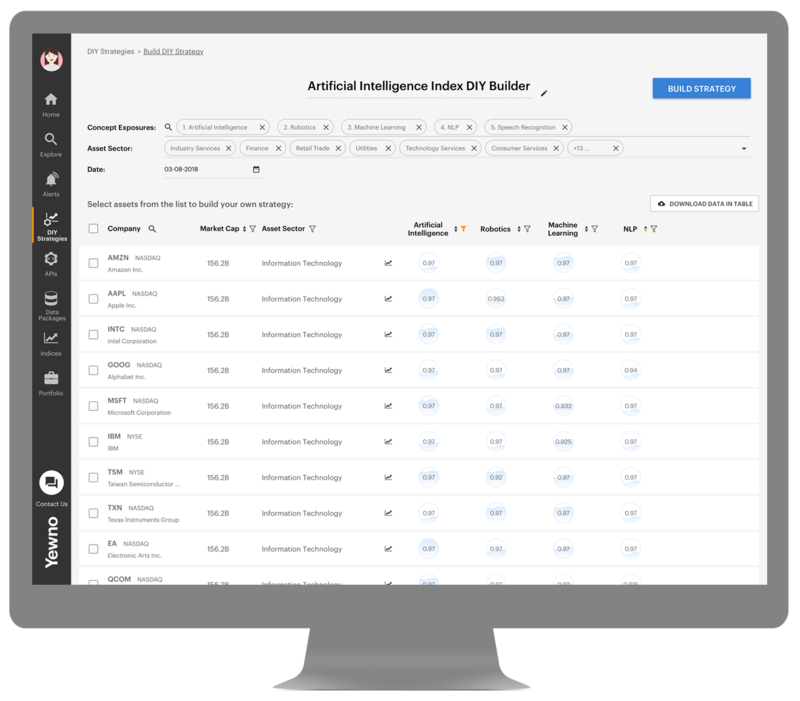 Recently, Redwood City California-based AI and alternative data provider Yewno, launched its newest financial services product called Yewno Edge enabling analysts and portfolio managers to access Yewno’s AI technology and an underlying dynamic knowledge graph. Although currently in beta, the Yewno Edge web portal allows analysts and portfolio managers to directly access Yewno’s artificial intelligence technology and an underlying dynamic knowledge graph which aggregates a large volume of structured and unstructured data in order to identify companies that are exposed to specific “concepts” or themes such as artificial intelligence (see below). This feature is dubbed DIY Strategy. In addition, Yewno Edge allows analysts to tweak the constituents of these portfolios and backtest the thematic strategies utilizing flexible weighting schema, constraints and rebalancing frequency. Once a strategy has been built, a client can save and track this strategy going forward. 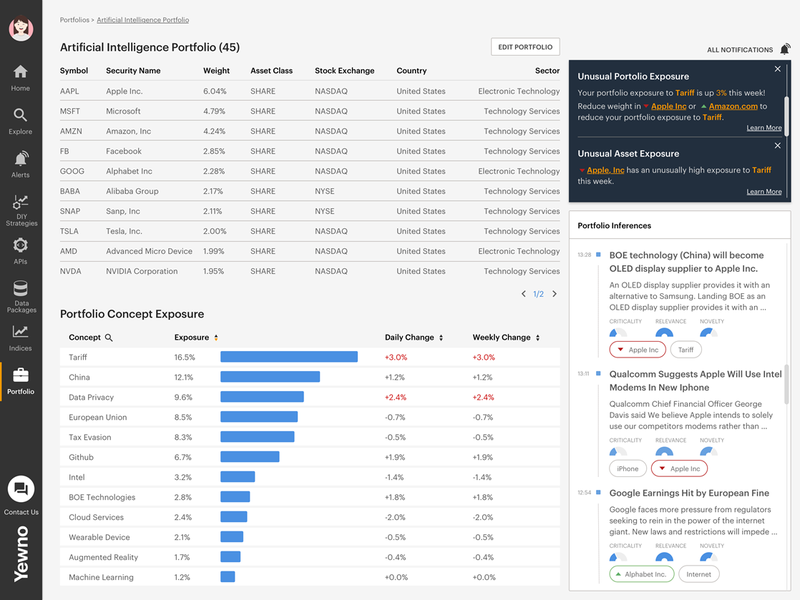 Another use case for Yewno Edge is to allow analysts to conduct an exposure analysis of a portfolio to various concepts or themes. The screenshot below shows an analysis of a portfolio called artificial intelligence to various concepts like “tariffs”, “China”, “data privacy”, the “EU”, and “tax evasion”. Yewno Edge also provides clients with an ability to track these exposures on an ongoing basis and makes specific recommendations of how a user can increase or reduce specific exposures if so desired. In recent months, Yewno has launched a suite of indices, including the STOXX AI Global Artificial Intelligence Index in January; the Nasdaq Yewno Global Disruptive Technology Benchmark Index in May; and then last month, Yewno launched its Blockchain index with STOXX. Besides these indices, Yewno has also launched a number of alternative data feeds primarily targeted at quantitative hedge funds. The firm’s Emerging Technologies data feed, has been added to FactSet’s new alternative data marketplace while it also added the Yewno Alpha Matrix and Emerging Technology datafeeds to Nasdaq’s Analytics Hub data platform. Now, Yewno is in the process of launching a subscription website which will allow analysts to directly access and conduct investment research leveraging the firm’s concept based knowledge graph. This is an interesting move as the firm has previously launched products for quantimental investors (alternative data products) and fundamental investors (its various index strategies). Yewno Edge is another new product aimed at serving the fundamental investor community. This suggests that Yewno has decided that some of the most lucrative ways to leverage its AI technology is to build a variety of products for fundamentally oriented investors as opposed to focusing its technology primarily on the quant market. While we expect Yewno will try to serve quantitative investors, we believe the firm will continue to launch new products to capture a larger share of the numerically larger fundamental investor market.